This September, my cousin Tyler married his fiancé Michael in beautiful Santa Barbara, CA. While each groom’s brother served as their respective ‘Best Man’, Tyler’s sister Courtney walked him down the aisle. When they started planning for the wedding, Courtney asked if I could design her something unique and special. She didn’t want a typical bridesmaid dress, and she needed to work within a specific color palette. She also knew she wanted a halter neckline and A-line silhouette. Not only was I happy to design something special for my cousin, but I loved working with Courtney to dream up a gown that accommodated both the event, and her personal style. 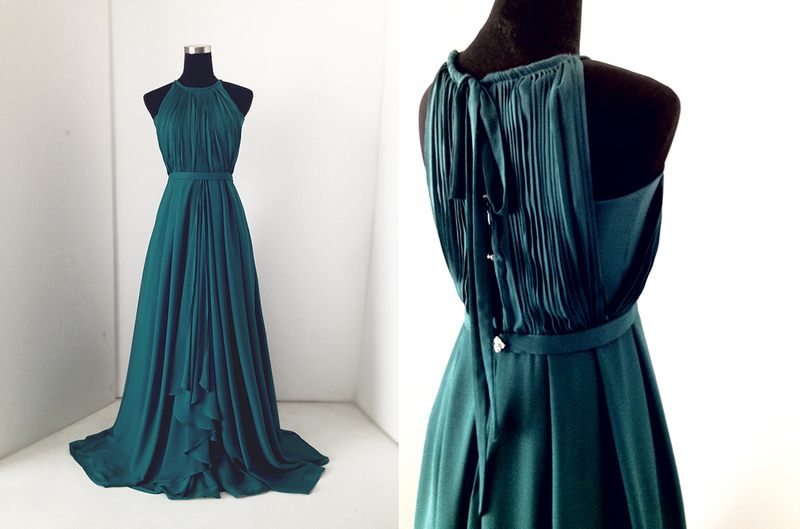 The result: an Ocean Green gown that’s sleek and elegant–but not overly feminine or fussy. An accordion pleated chiffon overlay creates texture and subdued detail while a parting draped chiffon skirt adds elegance. The gown features a cinched waist with belt over a fitted and structured bodice. 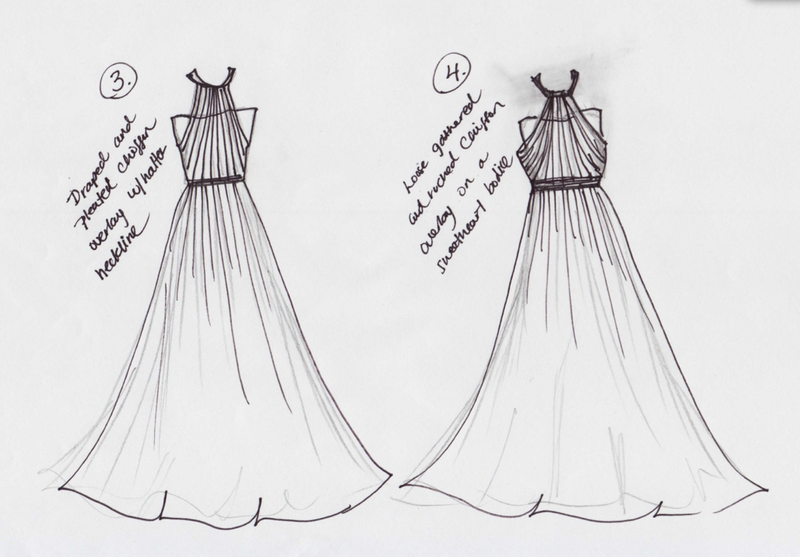 Here’s a look at some of the sketches we did for Courtney – with her final gown resembling sketch #3. Courtney loved her gown, and it was the perfect compliment to the wedding’s lush outdoor reception in the hills of Montecito, overlooking the Pacific Ocean. I loved being able to design her exactly what she wanted for her brother’s special day. To begin your custom design experience, or to book a consultation at the Lauren Elaine Style House in Los Angeles, CA, please contact salesrep@lauren-elainedesigns.com or visit LAUREN ELAINE CUSTOM.